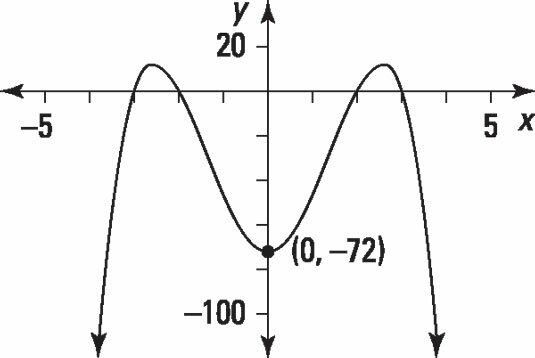 Polynomial functions have graphs that are smooth curves. They go from negative infinity to positive infinity in a nice, flowing fashion with no abrupt changes of direction. Pieces of polynomial functions are helpful when modeling physical situations, such as the height of a rocket shot in the air or the time a person takes to swim a lap depending on his or her age. Most of the focus on polynomial functions is in determining when the function changes from negative values to positive values or vice versa. Also of interest is when the curve hits a relatively high point or relatively low point. 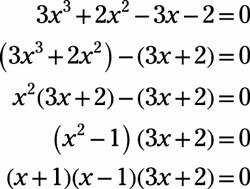 Some good algebra techniques go a long way toward studying these characteristics of polynomial functions. Find the real roots (x-intercepts) of the polynomial by using factoring by grouping. First, factor by grouping. Break up the polynomial into sets of two and then find the greatest common factor of each set and factor it out. Finally, factor again. Write an equation for the given polynomial graph.